Strike down the supporters of the false emperor with new downloadable content that lets you play as Chaos Space Marines in the 4 player Co-op mode against Imperial Guard and Space Marines. Strike down the forces of the Imperium or defend the Emperor with three new multiplayer maps and unlock new achievements. "Only the greatest Space Marines and vilest Chaos Space Marines are given the chance to become the heavily armored 20 foot tall Dreadnought. Fight to control the ancient machinery necessary in multiplayer to encase one member of your team inside the walking destructive force that is the Dreadnought. Strike down the Imperium or defend the Emperor on three new multiplayer maps. " Capture and take control over series of dynamically selected control points, in this new multiplayer game mode. Rush to capture the control point before it changes or the enemy captures each. Control the objective earns your team additional points and respawns the objective in a new location to be fought over. Corrupted and swollen by the pestilences and plagues that afflict them Death Guard Champions prefer short ranged combat where they can spread the diseases that the Chaos God Nurgle has blessed them with. Immune to pain or damage they grimly advance forward laughing off attacks and leaving a trail of pestilence and disease behind them. One of the noblest and most heroic of the Space marine Chapters, the Blood Angels have fought the enemies of humanity for ten millennia. Cursed by a dark flaw, they are driven into battle with unmatched ferocity and when they descend into battle, no foe can stand against their wrath. 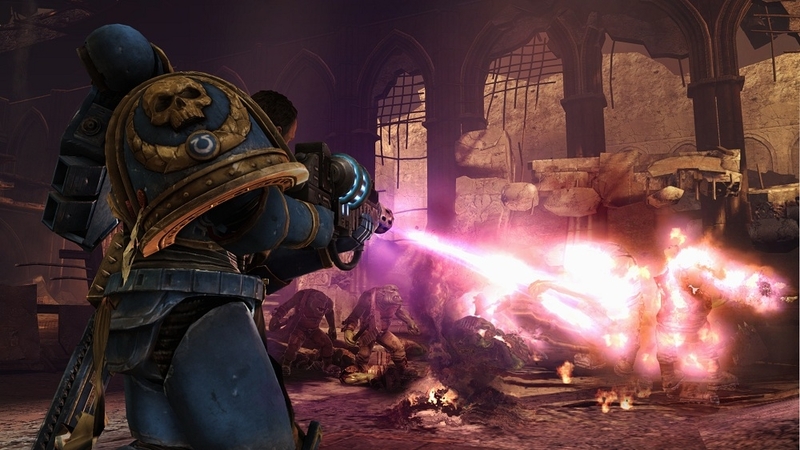 Secure your Space Marine Chapter standard or the Chaos Space Marine Icon of Chaos Undivided with this free new multiplayer game mode. Experts at close ranged combat, the Salamanders favor weapons like the melta gun and make heavy use of flame ornamentation on their weapons. Experts at infiltration the Alpha Legion roam the galaxy spreading heretical Chaos Cults using subterfuge and misdirection to further their intricate plots. Like they multi-headed Hyrda that they use as their symbol the Alpha Legion will attack from multiple areas. 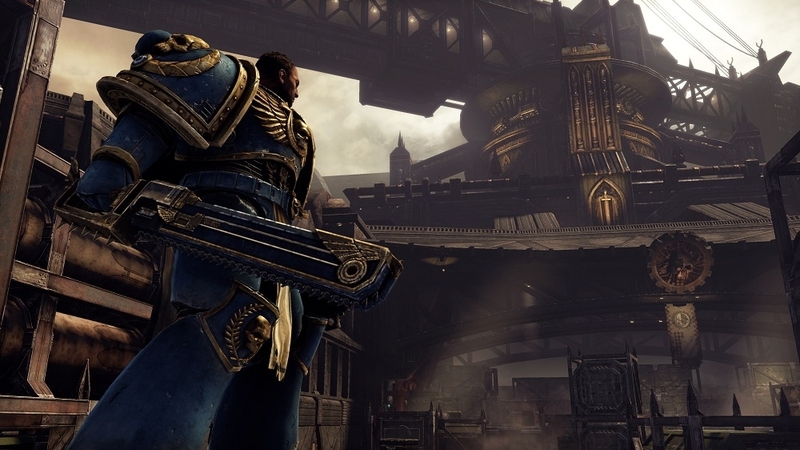 Step fearlessly into the heart of combat as Captain Titus of the Ultramarines, unleashing visible violent death against the enemies of mankind in the first 3rd person action shooter set in the dark future of the Warhammer 40,000 universe. Storm into battle and use a combination of the most lethal ranged and melee weapons against the feral Orks and insidious forces of Chaos. Experience the awe inspiring landscapes and immense battles of the Warhammer 40,000 universe. 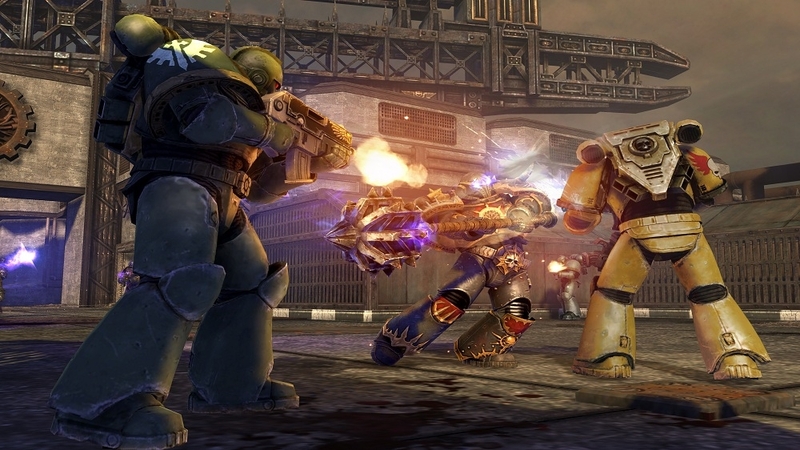 Form your own Space Marine squad or Chaos Space Marine warband and take the battle online. Renowned crusaders against the enemies of humanity, the BLACK TEMPLARS eschew the idea of a home world. Instead, they have taken to the stars in mighty crusade fleets, actively seeking out the enemy throughout the Galaxy. -- The SPACE WOLVES are the most savage and barbaric of all the Space Marine Chapters, whose red-hot battle-lust is channeled through boltgun and frost axe. They are warriors of myth, whose noble deeds give rise to legends. RELIC BOLTER: A masterpiece of the Techmarine's craft, this gleaming bolter is among the most prized items in the chapter armory. Firing self propelled explosive tipped rounds, it is said to be the Emperor's will made manifest. -- POSSESSED BOLTER: The subject of fearsome rituals, this boltgun contains the bound spirits of ancient daemons of warfare. Each self-propelled explosive round is branded with these daemons' own sigils. RELIC CHAINSWORD: This gleaming master-crafted chainsword combines terrifying power and great speed. It is traditionally entrusted to champions of the chapter or members of the Chapter Master's own honor guard. -- POSSESSED CHAINSWORD: Daemons of bloodshed and terror have been bound into the very heart of this fearsome chainblade. These dark rites have not reduced the weapon's speed or precision on the battlefield. 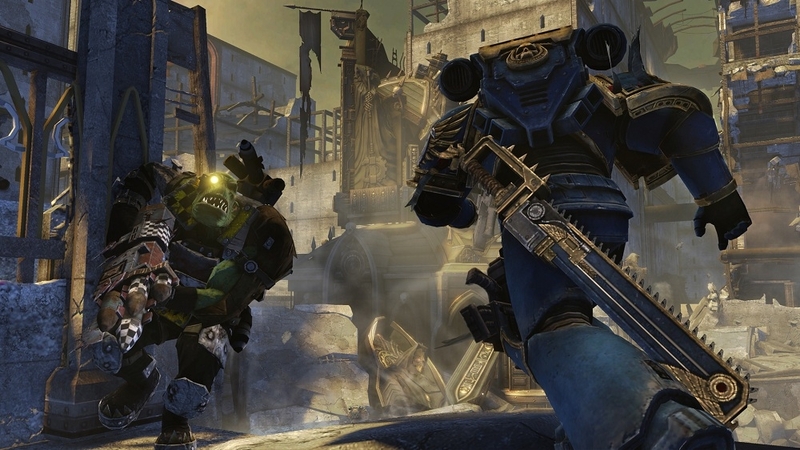 Stand together or die alone in the 4 player Co-op mode Exterminatus. Fight against waves of Orks and Chaos to see how long you can surive. Earn experience points and unlock new weapons and abilities that you can use in Co-op and Competitive Multiplayer matches. The Elite Pass grants you access to progress past level 5 in multiplayer, giving you access to many more game unlocks and perks.